Despicable Me 3 arrives on DVD AND BLURAY just in time for the holidays!! The characters beloved by everyone – Gru, his wife Lucy, their three adorable daughters—Margo, Edith and Agnes—and the Minions provide hours of family fun in this heartwarmingly subversive comedy from Academy Award®-nominated producer Chris Meledandri (Despicable Me Franchise) and directors Pierre Coffin (Despicable Me Franchise) and Kyle Balda (Minions 1 & 2, The Lorax). 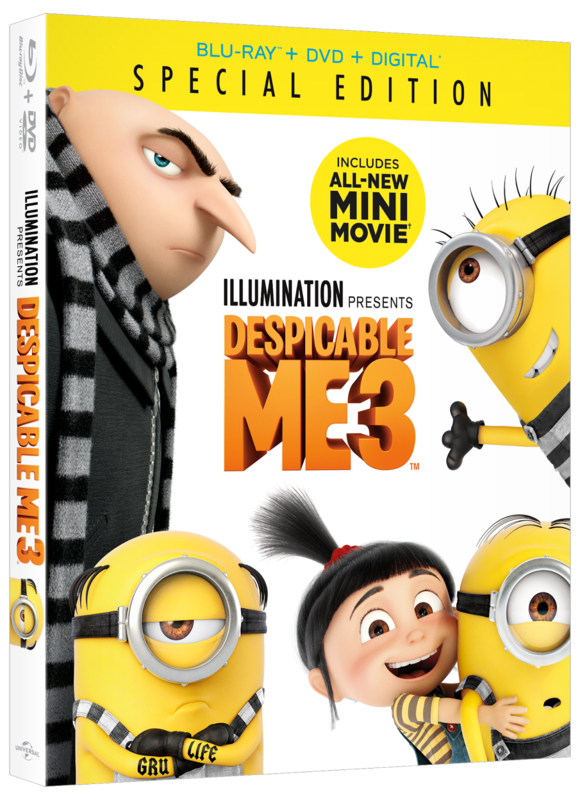 Hailed as “the best Despicable Me movie yet,” by Ali Plumb of BBC Radio 1, with over $949 million in global ticket sales, Despicable Me 3 is the ultimate holiday gift, with almost an entire hour of exclusive bonus features including an all-new mini-movie, a never-before-released deleted scene, and much more! My boys and I actually got to see this movie in theaters. We loved it so much though that they kept begging me buy it when it released. Gru gets to meet his long lost brother Dru, who just happens to have a glorious full head of hair. To provided much torment for Gru, but added much laughter for everyone else. The girls of course are as sweet as ever. Agnes is determined to find a unicorn in this movie... AND SHE DOES... well kind of. I wont spoil it, but I can promise you will giggle. And finally the Minions, it wouldn't be a Despicable Me movie without them. Well in this movie they go to jail, build a plane, escape jail and even have one heck of a singing/dance number. I like that we get to see all the characters grow. Even the minions do some personal growth in this movie. For anyone that followed the movies so far, you do not want to miss this one. The ending suggest we may see more for this beloved series.